Last August, the New York Empire State Development Board (ESD) gave preliminary approval to a $10 million subsidy being sought by FreshDirect to relocate to the South Bronx. 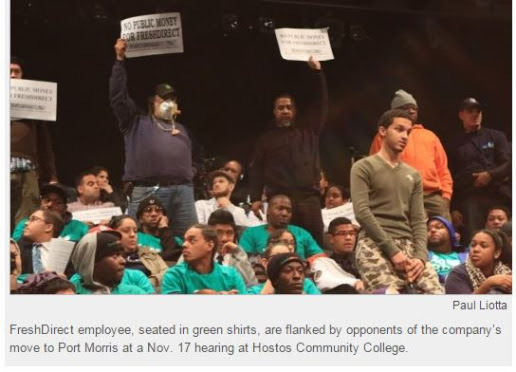 Following public outcry and a statutory requirement that ESD give primary consideration to the needs and desires of the local community, a public hearing took place in Mott Haven three months later in November. At that time, upwards of 200 Mott Haven-Port Morris residents, physicians, political leaders, religious leaders, labor leaders, business owners and nonprofit organizations provided testimony (in person and electronically) against the subsidies. FreshDirect bused in nearly 100 of its employees (paid $7/hr to be there) to manufacture support, but not one single local resident testified in favor of the project. The ESD Board will now re-vote.